The must-have companion workbook to the bestselling Teach Like a Champion 2.0 Teach Like a Champion Field Guide 2.0 is the teacher's hands-on guide to improving their craft. In Teach Like a Champion 2.0, veteran teaching coach Doug Lemov updated, improved upon, and replaced the original edition of this global bestseller, setting forth 62 of the most rigorously vetted and critically observed teaching techniques around. Field Guide 2.0 is a practical workbook for these 62 techniques, outlining all the tools a teacher needs to make champion teaching a reality in their classroom starting now. Coauthored by fellow educators Joaquin Hernandez and Jennifer Kim, the book is a practical guide for adapting the techniques to fit classrooms and teachers everywhere. With over 75 video clips of the techniques in play and 100+ field-tested activities to boot, Field Guide 2.0 is the professional development tool every school leader dreams of. It's the teaching playbook that every teacher, principal, and coach should have in their library, chock-full of actionable tools that unlock a teacher's potential so they can push their students to do the same! The updated '2.0 ' version of Teach Like a Champion written to update, improve upon and replace the original Just like Teach Like a Champion Field Guide helped educators put the original 49 techniques into practice, Field Guide 2.0 is the ultimate resource for the 62 techniques in Teach Like a Champion 2.0. They're the most rigorous, champion-vetted techniques yet and this book takes you through them from top to bottom with the kind of clarity and breadth you've come to expect from the experts at Teach Like a Champion. The book includes: * Practical approaches to each of the 62 techniques *75+ video clips with analysis of the techniques in play in the classroom (note: for online access of this content, please visit my.teachlikeachampion.com) * Hands-on activities to bring the 62 techniques from the page into the classroom Teach Like a Champion 2.0 is a book by educators for educators. It's about giving teachers what they need to share their strengths so that every teacher, from first year rookie to third-year veteran, can approach their classes with the skills they need for their students to succeed. 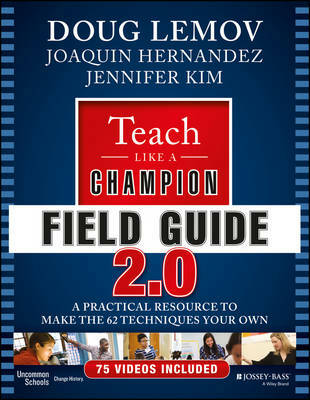 Teach Like a Champion Field Guide 2.0 is the indispensable guide to getting there, one technique at a time.